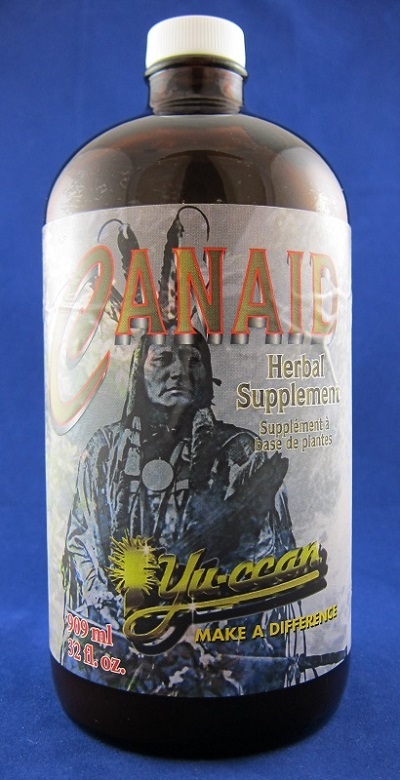 CanAid (909 ml)- Save-On Nutrition Centre Ltd.
YU-CCAN proudly brings you the benefits of a most remarkable blend of herbs. This ancient but still sought after natural gift to mankind has long been treasured for its exclusive properties. CANAID HERBAL TEA is also known for its pleasant herbal taste. Your whole family can enjoy this refreshing, beneficial beverage. Guaranteed 100% pure herbal. The human body constantly absorbs all kinds of undesirable and toxic substances from various sources: the additives and pigments in the food, the carcinogenic substances in the pesticide and drinking water, the pollutants in the air, and etc. If the toxic substances are allowed to accumulate in the body, the immunologic system may be inhibited or damaged to some extent. In this case, various diseases may be contracted: cancer, asthma, allergy, rheumatic arthritis, internal secretion imbalance, and etc. CANAID HERBAL TEA can remove the toxic substances from the body in a short time. CANAID HERBAL TEA and YU-CCAN HERBAL DRINK are like a catalyst for the whole body. They provide the most important condition for recovering; as a result, the blood becomes clean, the oxygen carrying capacity is increased, the ferment making returns to normal, the immunologic adjusting function becomes more sensitive, and the anti-disease ability is increased. Properties and Uses: The Japanese name for this vegetable is Gobo. Burdock is a very yang, strengthening root vegetable. It can reduce swelling around joints and help rid calcification deposits, for it promotes kidney function to help clear the blood of harmful acids. Herbalists from around the world revere this herb to be the ultimate blood purifier. It is a powerful healing aid; detoxifier and helps balance hormones. It is rich in vitamins A, B, C, E, P, Paba, Iron, Sulphur, Calcium, Silicon, Iodine, and Zinc. It contains anywhere from 27% to 45% Inulin, a form of starch, which is the source of much of its nutritional and curative powers. Inulin is a substance that is important in the metabolism of carbohydrates. In Europe it is used as a remedy for prolapsed and displaced uterus. Burdock, when mixed with Sassafras and made into a tea, is said to release a strong oil that is soothing to the hypothalamus. It also aids the pituitary glands in releasing an ample supply of protein to help adjust hormone balance in the body. It is said that a poorly nourished pituitary gland is sometimes responsible for overweight. Properties and Uses: It is an astringent, aperient, tonic, stomachic. In large doses it is good for headaches, constipation, diarrhea, and hemorrhoid. It is useful for colon, spleen, and liver disorders, jaundice, abdominal pain, amenorrhoea, carbuncles, scalds, and burns. Enhances gallbladder functions, and has a positive effect on duodenial ulcers. In low doses, it increases gastric secretion and therefore acts as an appetite stimulant and increases the secretion of bile. It has anti-inflammatory and antiseptic properties. Properties and Uses: It is considered one of the most valuable remedies in herbal practice, having wonderful strengthening and healing properties. Slippery Elm has the ability to neutralize stomach acidity and to absorb foul gases. It aids in the digestion of milk. It acts as a buffer against irritations and inflammations of the mucous membranes. Slippery Elm properties help to assist the activity of the adrenal glands. It helps to boost the output of cortin hormone which helps send a stream of blood building substances through the system. It is used as a food whenever there is difficulty holding and digesting food. It draws out impurities and heals all parts of the body. It has the ability to remove mucous with stronger force than other herbs. It has Vitamins: E, F, K, and P. It also contains Iron, Sodium, Calcium, Selenium, Iodine, Copper, Zinc, and some Potassium and Phosphorus. Properties and Uses: The leaves are used like greens, as spinach, and are very light in life-giving properties. It kills putrefaction in the blood, expels worms, and is warming to the heart. The root boiled is good for profuse menstruation or stomach hemorrhage. Also extremely effective in helping to heal kidney, bladder, and liver problems such as gravel, stones, and jaundice. A poultice is excellent for cancer, boils and tumours. Copyright © 2019 Save-On Nutrition Centre Ltd.
Disclaimer: The material on this site is provided for informational purposes only and is not medical advice. Always consult your physician before beginning any diet or supplement program. Statements made on this site have not been evaluated by the Food and Drug Administration or Health Canada. These products are not intended to diagnose, treat, cure, or prevent any disease.